Teenage Mutant Ninja Turtles (“TMNT”) was an indie comic book launched in 1984. It was an underground parody of popular comics of that time, such as Daredevil. Oddly enough it became a marketing phenomenon a few years later, with a massive media and merchandising presence during the late 1980s and early 1990s. Our TMNT profiles are currently based on the original, Mirage Comics run – specifically issues #1-#21. Everything else is ignored for now. At this point the book is still about 4 uplifted turtles trained in ninjutsu by an uplift rat. 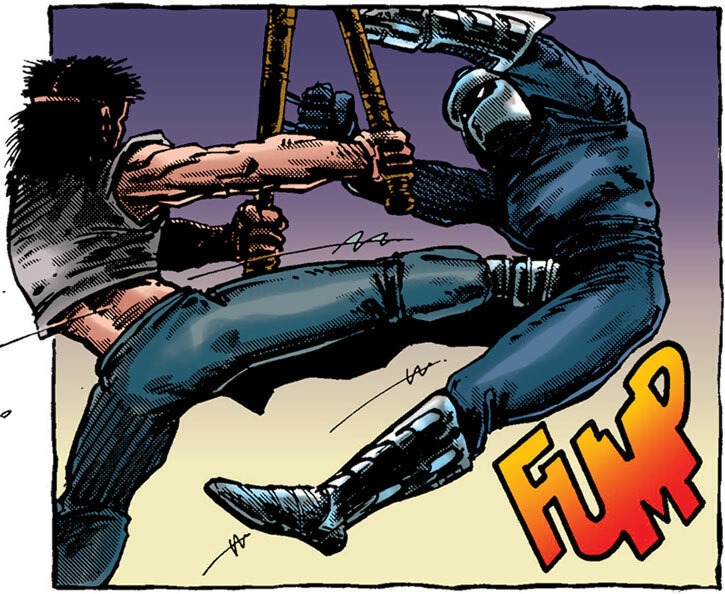 They chiefly fight evil ninjas in the city in a spoof of 1980s Daredevil noir atmosphere. At this point, the character of Casey Jones was (IMHO) the most interesting. He was created on a whim by TMNT authors Laird and Eastman as a poke at characters like Batman and Daredevil whose crime-fighting was inspired by some tragedy in their past. In stark opposition, Laird and Eastman decided to create a crime-fighter who gained his inspiration from bad TV. 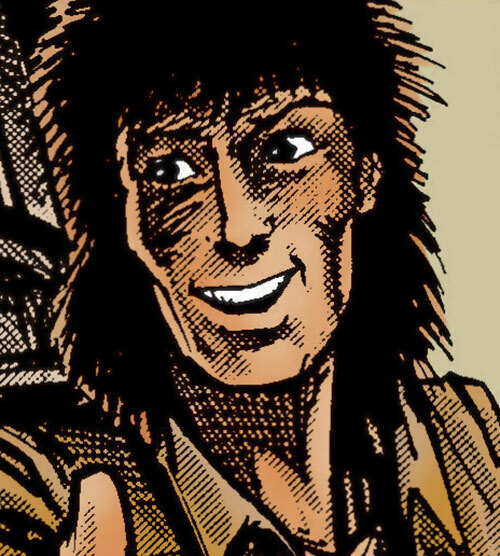 This type of spontaneous creativity was the hallmark of the series at the time. If you’re not familiar with the material, check our Teenage Mutant Ninja Turtles team profile first. Group Affiliation: Teenage Mutant Ninja Turtles. Base Of Operations: Brooklyn, New York, US. 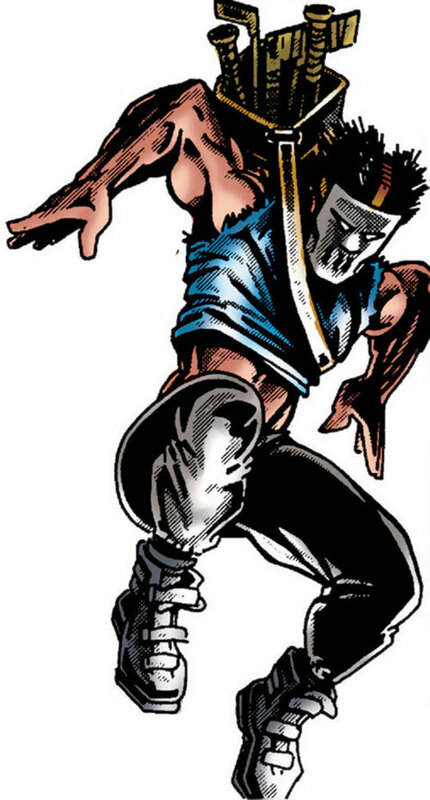 Casey Jones is a natural athlete who has honed his natural strength, agility and combative abilities to their absolute maximum. Though he has no formal training in melee combat, his unorthodox (and seemingly irrational) fighting style combined with the frantic pace that he sets enables him to bulldoze through most opponents. In the past, he has managed to literally club his way through small groups of ninja assassins and has even managed to stand toe to toe with the Shredder himself. Casey’s arsenal is made up of various pieces of sports equipment that he carries in an old golf bag. Each piece of the battered equipment is covered in layers of athletic tape, for ease of gripping as well as balance. 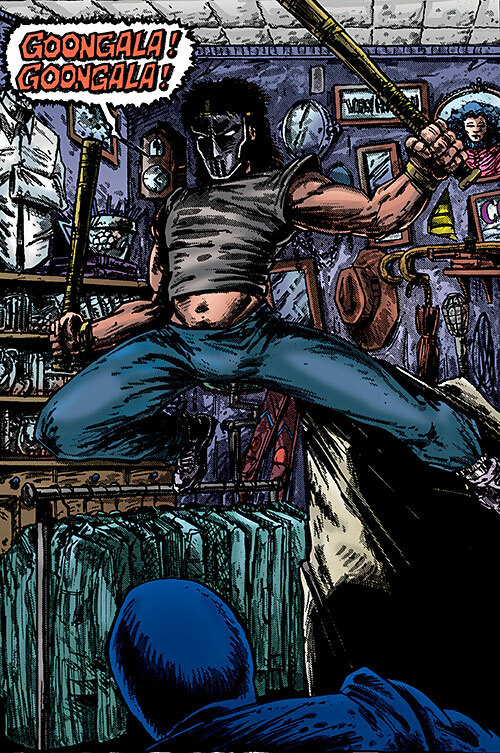 Casey Jones was living a listless, non-eventful life right up until the night he decided to don his old hockey mask and fight crime. He lived day by day and barely eked out a living as a general handyman in the small, rundown apartment building where he made his residence. He filled his time between jobs working out and watching horrible cop dramas on the television. One night, inspiration struck Casey after his favourite cop drama came to an end. The show (which was in the vein of Dirty Harry and/or Murphy’s Law ) made Casey realize that there were too many criminals on the street for the cops to handle and that they needed help. His help. 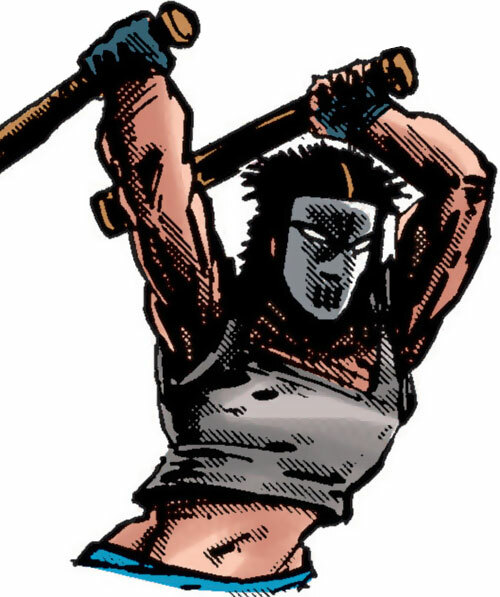 With that, Casey threw on an old hockey mask, grabbed a golf bag full of sports equipment and charged out into the night looking for criminals to punish. In short order, he stumbled across an attempted mugging that had gone awry thanks to the intervention of Raphael (one of the Teenage Mutant Ninja Turtles). 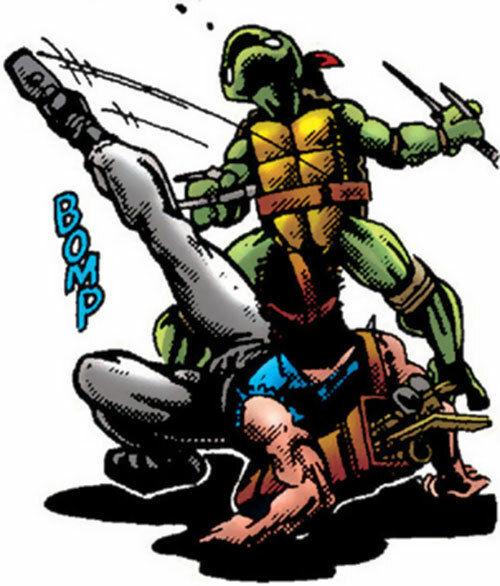 While he was initially pleased to see Raphael manhandling the muggers, he grew confused when Raphael let them retreat without finishing the job. Unwilling to let that stand, Casey dropped down from his rooftop perch and immediately laid into the fleeing muggers. To his shock, even as he was bashing heads and shattering femurs, he heard Raphael rushing towards him telling him to stop. In a blink of an eye, Casey’s confusion turned to rage and he attacked Raphael with all of his considerable strength. The sheer fury and frenzied nature of his attacks actually allowed Casey to fight his highly trained opponent to a standstill for several minutes. Their fight travelled from the back alleys of Brooklyn to a forested park, where Raphael eventually gained the upper-hand and managed to beat Casey into submission. As the two took a breather from the fight, they heard another mugging in progress. Unable to let the crime take place, in that moment the two decided to work together and halt the mugging. In the process they came to an understanding and formed the initial bonds of friendship. One night, while on patrol, Casey spotted a group of men dressed like ninjas. They were surrounding and breaking into an old brownstone that held an antique store on its main floor. His curiosity got the better of him and he entered as quietly as he could behind them. 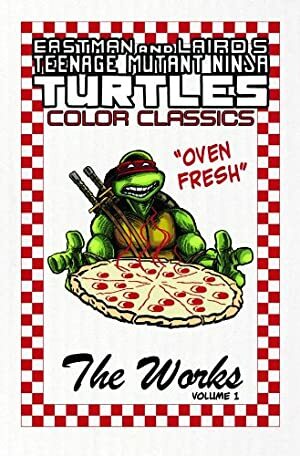 To his pleasant surprise, when he got inside he found the large group of ninjas had surrounded Raphael and his family and were preparing to attack. Excitement rushed through Casey, and after making a dramatic entrance, he tore into the group of ninjas with a zeal and fury that few could match. Casey’s intervention provided enough of a distraction (in addition to kayoing several of the ninjas) for the embattled ninjas to make their mistake. Casey along with the Turtles, Splinter and April O’Neil escaped the burning antique shop and disappeared into the night. The next day, Casey and the others gathered what little they could into an old trailer that Casey had and fled Brooklyn for the quiet fields of North Hampton. Casey’s grandmother had owned a farm there, which had been abandoned since her death. Casey opened his old home to his new friends. Over the next year, Casey shared a few adventures with them but mostly spent his time becoming closer to them (and April) and helping them recover from their horrible ordeal. Casey is a tall (but not overly so) athletically built Caucasian man with piercing eyes and dark hair. His hair has been cut into a mullet and hangs in spiky locks to his neck. He generally wears loose clothing which allows him the greatest freedom of movement in combat (normally a pair of dark jogging pants, a loose tank top and sneakers). The one element of his “costume” is the garish hockey mask that he sports into combat. The mask seems to be an old style goalie mask and completely conceals his face. Casey’s personality seems to have been completely shaped by 1980s cop dramas and movies in the vein of Dirty Harry, Sledge Hammer and Murphy’s Law. He is more than a little warped, and clearly has homicidal tendencies. Fortunately for us, he focuses his violent urges on the criminal element. Unfortunately for individuals that he designates as criminals, he has no sense of scale. He will react to a purse snatcher or pickpocket in the exact same manner that he would react to a murderer. With unbridled rage and ultra-violence. Casey’s time with the Turtles in North Hampton seemed to have mellowed him out somewhat and brought him some clarity of thought. Out of them all, he became closest to Raphael. The two shared many of the same interests: goofing off, lifting weights, and brawling. Area Knowledge (Brooklyn, New York), Familiarity (Automotive Repair), Lightning Reflexes, Luck, Schtick (Manic Pace, Unpredictable Style). Leonardo (High), Michelangelo (High), Donatello (High), Raphael (High), Splinter (High), April O’Neil (High). Catastrophic Irrational Attraction to Fighting Crime, Secret Identity, Serious Irrational Hatred (Criminals). Sports Based Weaponry (x5) [BODY 04, EV 03 (05 w/STR, 06 w/Martial artist)]. The IDW version of Casey is watered down compared to the earlier Mirage one. In the IDW continuity he’s definitely saner and isn’t depicted to be any near as strong or powerful as the original version. There was just something about Casey screaming “GOONGALA GOONGALA” that tickled me as a child. 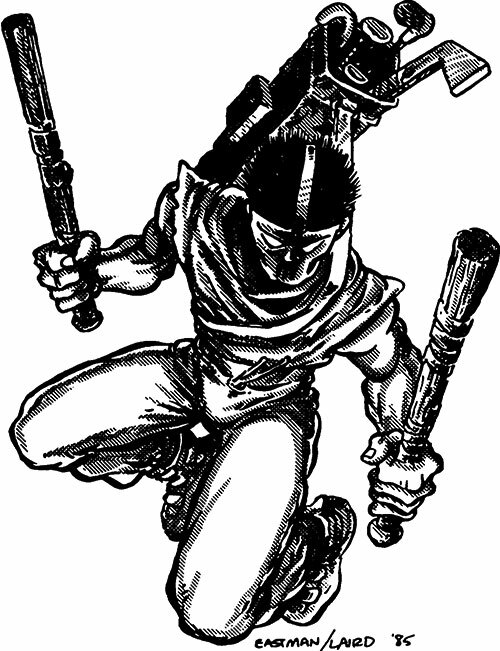 At any rate, I’ve statted Casey to be at least as effective as Donnie in the middle of a brawl, but his unpredictability in combat and strength even it out for him when he’s facing the typical ninja mook. 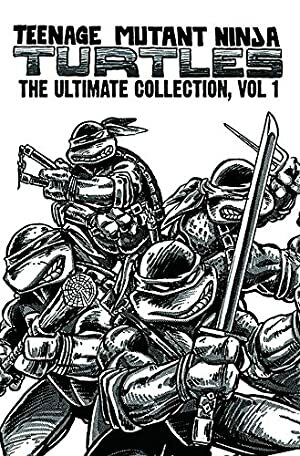 Source of Character: Mirage Comic Series – Teenage Mutant Ninja Turles, created by Kevin Laird and Eastman. Writeup completed on the 23rd of August, 2014.